A Japanese proverb says: You cannot decide to see Mount Fuji. Mount Fuji decides who gets to see him. All the traveler can do is show up and hope the mountain wants to be seen. During my travels abroad, I've always tried to prepare a careful itinerary, but also keep myself open to whatever experiences the trip and the country might also have in store for me. I don't believe in coincidence, and I do believe that keeping your eyes, mind, and heart wide open often result in experiences we never could have planned on our own account. Last year's research trip to Japan is a perfect example of what happens when you decide to "let Fuji-san decide" what you should see. Six months before that trip, my son sent photos of coffee jelly he enjoyed while studying in Kyoto. I'd never tasted coffee jelly, and envied his experience--especially when he told me how delicious and refreshing coffee jelly was with cream. I hoped to taste it in Japan, but neither he nor I knew how to track it down (he had it in his college cafeteria, a place I could not go). On our first morning in Kyoto, we went to the hotel restaurant for breakfast, and guess what I found waiting for me in the buffet line? It proved exactly as delicious as my son had said that it would be. 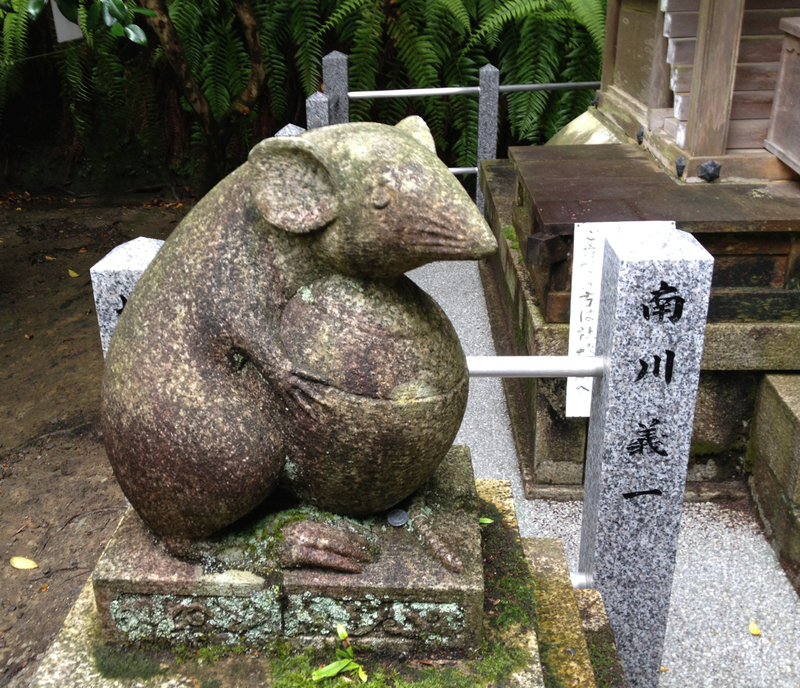 Guardian mouse at Ootoyo Jinja. The shrine even has two statues of guardian mice, symbols and messengers of Okuninushi. But for my willingness to step away from the path, I never would have seen this childhood favorite come to life. 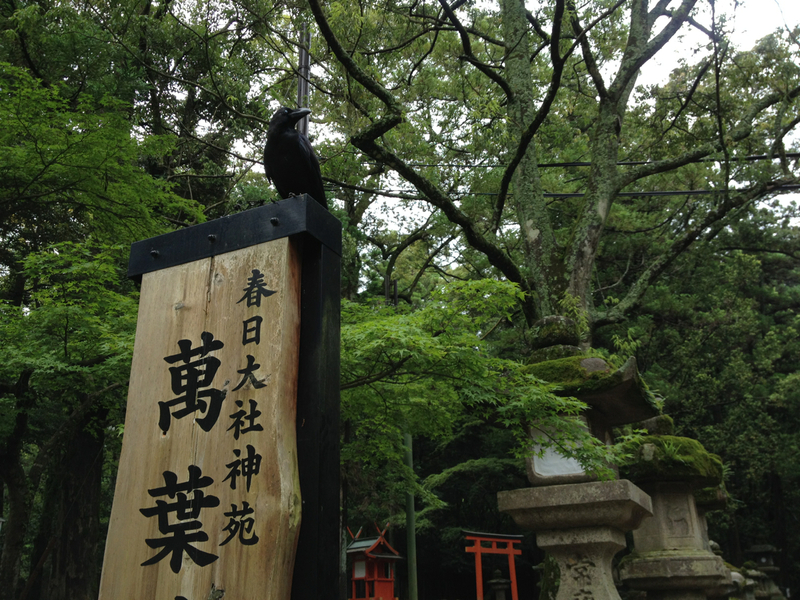 While climbing the slopes of Mount Inari (at Fushimi Inari shrine), I once more left the beaten path to follow an unmarked trail into the trees. Though clearly meant for visitors, it wasn't the pilgrim trail up the mountain, and I was the only one who took the route. The road less traveled, Japanese style. 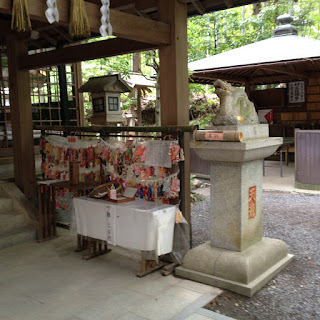 I discovered a hidden dragon shrine I didn't know was there. It was clearly set up for visitors, but none of my research and no one I spoke with told me it existed. 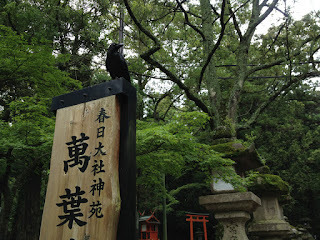 Waiting for me at the entrance to Kasuga Shrine (where I plan to set a novel). ... to the magical moment the following morning, when I arrived at Itsukushima just after dawn, as one of the Shinto priests began his morning meditations by playing a shakuhachi (flute). The Great Torii at dawn. Some people may call these random events, but I see a larger plan. Each of them gave me something I had always wanted, but didn't even realize I did. Each of them added magic to an already spectacular trip, and gave me memories I will carry for a lifetime. Even without these experiences, my journey to Japan was amazing, but remaining open to the adventures that might come along (instead of gluing myself to a plan that left no room for improvisation) the journey itself truly became more important than any given destination. Sixty-four days from today, I'll board a plane to return to Japan. 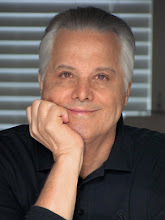 I'm teaching at the Japan Writers Conference in Tokushima (on the island of Shikoku) October 28-29 and then spending 17 days traveling across Japan to research the next four Hiro Hattori mysteries. Although I'm going with "things in mind" and a detailed itinerary of places to do and things to see, I'm also determined to remember that, when it comes to travel, amazing things happen when we release our grip on "the plan" and just let Fuji-san decide. I love the way you bring us along to discover alongside of you so much more about a culture you truly adore. Two questions: Do they do a decaf version of he jelly? And, did you know that I play the Native American flute, especially when the neighbors are rambunctious at night--and yes I watched and enjoyed your FB video. I love that I have the chance to bring you along with me! They actually do make decaf coffee jelly (surprise - it tastes exactly like the original) - and I had no idea you played the Native American flute! That's really cool . . . Now I'll have to figure out a way to be rambunctious enough to earn a performance. Susan, How beautiful! I see your soul in this. Thank you for this joy, my friend. Thank you Annamaria! I love this blog so much, because it feels like I get to see everyone else's soul in their blogs too, and I'm so happy that I can be a part of it. Thank you Everett. It's the story of my life too - and how wonderful that we get to go along for the ride. I have a friend like you Susan. We have learned to be wary of him. Three mile hill walks turn into thirty mile hikes. Instead of back at the car, we end up in somebody's back garden. Or in the emergency room. And once in the wrong country. Maybe I need more friends like you , and less like him. Caro, everybody, no matter how many friends he or she has, needs more friends like Susan! Love coffee jelly! Can we hear the Moscow story at Bcon? Absolutely, Cara. :) Are you coming to dinner Wednesday night? 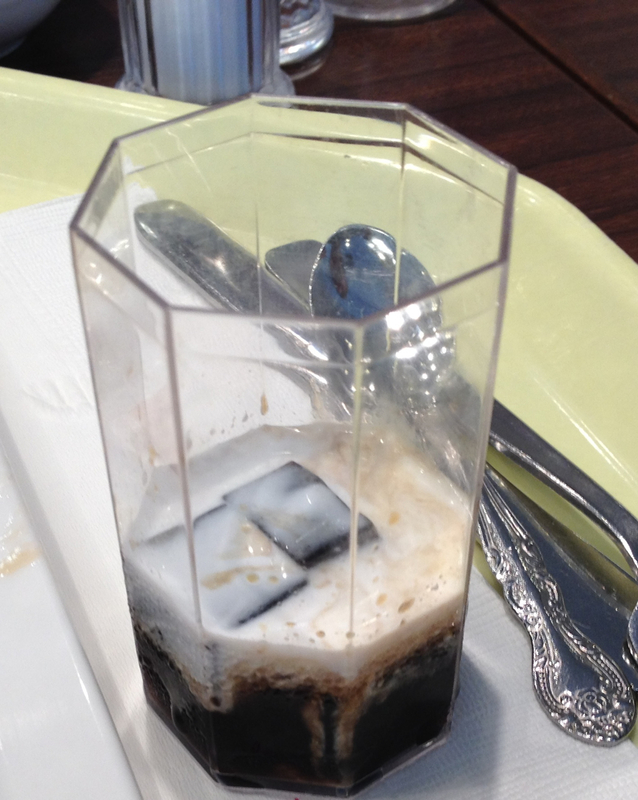 Love the blog - but coffee jelly is not exclusive to Japan - my grandmother taught me to make it. You just make up your coffee as you like it - black, white, strong , weak with or without caffeine, and while hot add gelatine (or vegetarian substitute. 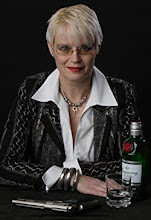 Pour into mould - her method - or glasses to look like your piture, cool and let set. If you do it her way - decant from mould when set and decorate with whipped cream - in glasses just add on top. Makes a nice dessert. Coffee Jelly is not exclusive to Japan, for sure - though the Japanese serve it cubed into bite-sized pieces, with a cream to top it, while the European versions seem more often to resemble a Jelly mold. It's intriguing to me that so many cultures enjoy variations on the same dishes - I love seeing how they play out in different cultures. Thank you for sharing your grandmother's version!